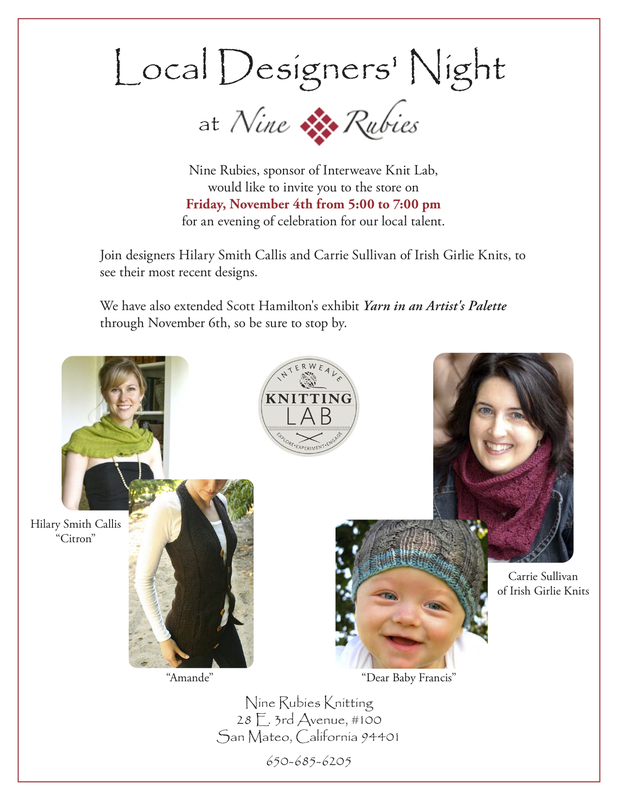 The Yarniad: Local Designers Night at Nine Rubies! Local Designers Night at Nine Rubies! But quite a bit has been going on in my knitting and crafting life and I feel like I have a big backlog of posts and things to tell you all. Let's hope I can get them all out before they become completely irrelevant! So first things first. Who's planning on going to Interweave Knitting Lab in San Mateo next weekend? I'm bummed not to be taking any classes, but my knitting gals and I will be roaming the marketplace floor on Saturday. Alas, I'll be here in front of the TV! Sounds like a great event! Hooray for Daniel being a good little sleeper -- I hope you manage to get back on a good sleeping schedule, too. Oh, trashy TV... I can't handle much of it, but I do love HGTV. I can relate to being tired all the time. It helps to make getting 8 hours sleep a priority and even if you don't feel tired go to bed earlier. My trashy TV indulgence is Survivor and I've watched that show since the beginning and I still like it - must say something1 about me! Have a wonderful time at the Designer's Night Event ~ wish I were close enough to attend!! !